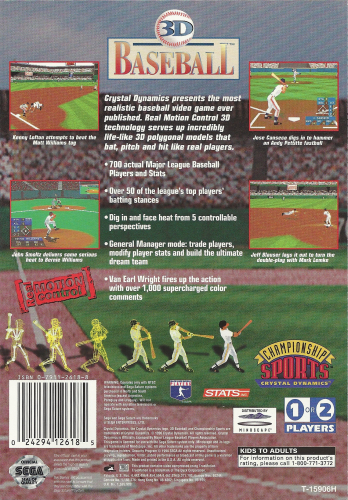 Get ready to sing "Take Me Out to the Ballgame" with Crystal Dynamics' 3D BASEBALL. 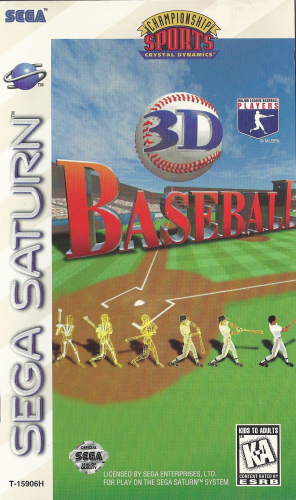 Thanks to motion-capture technology, every detail of professional baseball has been translated to the Sega Saturn. So you'll see diving catches, snap throws to first, and every other baseball animation imaginable. And with commentary by CNN sportscaster Van Earl Wright, you will swear that you're watching a game on TV. You'll also get all of the Major League players, thanks to the MLBPA licensing. Play a season by yourself or challenge a friend in Exhibition mode; the only things missing are the smell of leather and fresh-cut grass.